Everyone shall have the right to hold opinions without interference. 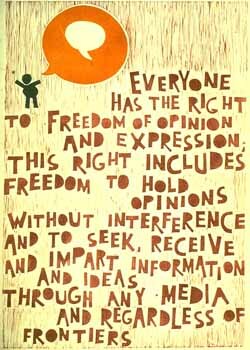 Everyone shall have the right to freedom of expression; this right shall include freedom to seek, receive and impart information and ideas of all kinds, regardless of frontiers, either orally, in writing or in print, in the form of art, or through any other media of his choice. ( b ) For the protection of national security or of public order (ordre public ), or of public health or morals. Point 3 a) is referring to slandering others or defamation of their character. Due to the sensitive nature of this point, I have been extremely meticulous when recounting events in my blog posts to keep the information accurate and to keep the identities of those involved concealed. However I have been accused of being slanderous against someone mentioned in my blog, they claim I am defaming their character in the way I have described my story, they claim they are taking their grievance to Court. They have not denied the accuracy of what I what I quoted them as saying, but claim some of it has been taken out of context. Really? My blog is from my perspective and my opinion. And it’s how I saw the events unfold. With cases of defamation of character, they are very hard to prove. First of all, if you take a case of Defamation of Character to a Court of Law it would need to be proved that without a doubt what was said or written about you is not true. If you can prove what was said is in fact false, then you then have to prove that it was said by the other person with the intent of causing you some kind of harm. Then, when you have proved the statement about you is false, you have to then prove it has in fact caused actual “Harm” to you or your reputation. Most lawyers will explain that the whole process is difficult, however the last part is the hardest to prove. This is due to the fact that there is a difference between a statement having the “potential” to cause you harm as apposed to having caused you “actual” harm already. This whole process could cause thousands of dollars and not produce a result at all. I have noticed when people get upset by things written about them, generally its due to embarrassment. My feelings are that if you don’t like how you are being spoken about, perhaps you should have changed your behaviour. There are things that I have written about myself that I am not proud of, I have come to accept that the past, is just that, past events that I cannot change. I refuse to make those things happen again in my future. I have learned valuable lessons from previous mistakes, I made a promise to myself that the behaviours of mine that caused me regret and that hurt others, I would never repeat. I can sleep at night knowing that I haven’t and never will do those things again. If you come from a place of love, and treat people with compassion and respect at all times then nothing bad can be said or written about you. If it does, know that you know the truth and then you will have no need to respond or acknowledge it, as you will know is isn’t fact. My blog has been constructed to be a place of releasing feelings and letting go of the past. I have found it has become an instrument in helping to inspire others, they can relate to my words. It is not a place to hurt anyones reputation or insult anyone. If I wanted to do so, I would have named names and purposefully identified individuals to shame them. That behaviour lacks integrity and also contradicts Agreement 1 of the Four Agreements that I follow; Always be impeccable with your Word. My stories could be about anyone. Most readers of my blog would have no idea who I am referring to. Also I have been an extremely private person over the years and not spoken about things that happened in my relationships. Therefore even my friends would be guessing about the identity of people in my posts. If I have offended anyone with my words.. I am genuinely sorry. I can’t help that my words may offend. I can’t take responsibility for how I affect people with my words. As they hear them with their own set of beliefs and issues they hold inside of them. If someone is angered by my words, I am not taking that personally. As you shouldn’t either. When we are offended we need to work out what it is that has triggered us. What is it about what was said that caused the discomfort or upset in us? Recognising what triggers us, can be quite a challenge. It is worth digging deep for it though, as there lies an incredible opportunity to heal whatever lies behind the trigger, which is the beauty in recognising and accepting it. Making peace with things that upset us, sets us free. It improves the quality of our lives and makes us a better person for everyone to be around.